Daily Illuminator: Reminder: Munchkin Shakespeare Preorders Close Monday! April 12, 2017: Reminder: Munchkin Shakespeare Preorders Close Monday! On Monday, April 17, we will close preorders on the Munchkin Shakespeare game, expansion, and accessories. On April 18, we'll assemble the final print numbers and place our order with the factory; the project is on track to go to print toward the end of this month. We're trying something new with Munchkin Shakespeare: keeping our orders conservative and focusing on the overall and immediate profitability of the project. In the past, we have based our print numbers on a combination of experience, chatting with distributor and retailer partners, and watching gamer response to the announcement of a new Munchkin game. That often led to print runs of 10,000, 20,000, or more, and in many instances, a new game would still go back for a reprint within the first year of release. With Munchkin Shakespeare, our plan is to print only slightly more than necessary for our Kickstarter and preorder needs, probably leaving only enough copies of the game and accessories to fulfill a month or two of sales. Munchkin Shakespeare will not go back for a reprint any time soon. Going into this project, we knew that the subject matter limited its popularity, so we're going to let Shakespeare come in and go out quickly. Any of you who want the game will need to preorder today – either through BackerKit or at your local game store – to guarantee receiving it later this year. This isn't to say that we will never reprint Munchkin Shakespeare – we might. But a reprint is unlikely this year or next. We'll keep an eye on things and reprint if it feels like there's enough demand. 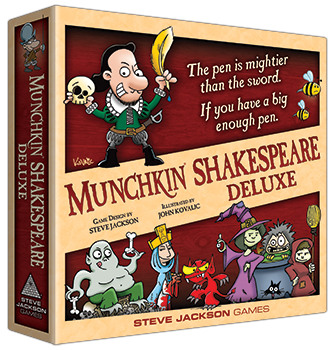 It is possible that a hypothetical second printing would not be a Deluxe game, so if that is important to you, you may want to go ahead and preorder Munchkin Shakespeare Deluxe now. Limited Engagement, the Kickstarter-exclusive expansion, will not be reprinted. It is also highly unlikely that the various Shakespeare accessories will be reproduced once they have sold out (most of our accessories are one-printing-only, and Munchkin Shakespeare doesn't look like it will be an exception). Special note for our retailer partners: We absolutely want to make sure that you're included in the fun! Retailers can order any and all of the Munchkin Shakespeare products, including Limited Engagement, by heading over to our Warehouse 23 direct sales page. You can also reach out to our Retail Liaison, who will get you squared away. The April 17 deadline applies to y'all, too, so don't wait!